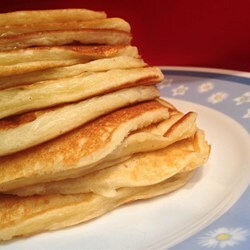 Greek yogurt pancakes can be made with an egg white rather than a whole egg, if desired. Whisk yogurt in a bowl until smooth creamy; add egg and whisk to combine. Whisk flour and baking soda together in a bowl; add to yogurt mixture and stir until smooth.